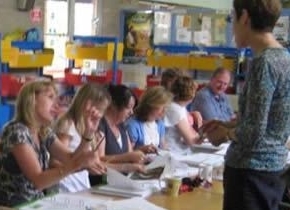 During March and April, we were delighted to deliver Catch Up® Literacy and Catch Up® Numeracy courses in Guildford, Colchester, Crewe, Southampton, South Wales, London, Merseyside, North Wales, Kent, Leicester, County Limerick and Australia! Our Catch Up® Accredited Trainers worked with groups in some of our Regional Training Centres and were also pleased to be hosted by some very welcoming and enthusiastic schools. As always, the trainers enjoyed learning about the many different settings who will be using Catch Up®, and getting to know the trainees – over 200 in total! Across all of our courses, the average trainee response to ‘How would you rate the training course overall’ was 4.5 (with 1 being least helpful and 5 being most helpful)! We always welcome feedback from our training courses, and were very pleased to receive some very positive comments over the last few weeks.